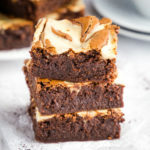 These Mocha Cheesecake Brownies are every chocolate and coffee lover's dream dessert! They're easy to make and they're so moist and chewy! Preheat your oven to 350 degrees Fahrenheit and prepare a 9-inch by 13-inch rectangular baking dish by greasing it with butter and lining it with parchment paper. Set aside. In a large microwave-safe bowl, add the chopped chocolate and cubed butter and heat on 50% power for 30-second increments until the butter and chocolate are melted. Be sure not to burn the chocolate by over-heating. Stirring every 30 seconds helps too. Once the chocolate and butter is melted, whisk in the white sugar and then the eggs and vanilla, just until well blended. Add the instant coffee and flour, and mix with a rubber spatula. Be sure not to over-mix. Pour the brownie batter into the prepared baking dish and smooth out the top as much as possible. Set aside. In a separate bowl, combine the cream cheese, sugar, egg, flour and cinnamon with a wire whisk until the mixture is smooth. Add the cream cheese mixture in dollops on top of the brownie batter in the baking pan. Using a knife or wooden skewer, create a swirl pattern. Bake at 350 degrees Fahrenheit for about 40 minutes or until a toothpick inserted into the centre of the brownies (through the chocolate brownie base) comes out clean. Let cool in the pan for 20 minutes before using the parchment paper lining to remove the brownies for slicing. These brownies are best stored in the fridge, and they keep in an airtight container for up to 3 days.